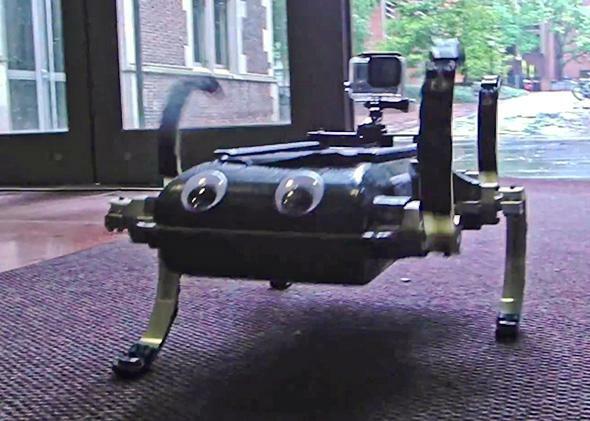 FlipperBot, RHex: Military robots get adorable—and creepy. RHex, a larger and more mature cousin of the MAST research. Goldman created FlipperBot as a model to figure out how sea turtles use their flippers—appendages that sport an obvious utility for traveling through water—to crawl through sand. For the Georgia Sea Turtle Center, which contributed to a six-week study on hatchling movement for the paper, insights from FlipperBot might help explain why some babies get stuck on their journey from nest to ocean. To paleontologists, the baby bot could be a step to understanding how fish may have first crawled out of the water and onto sand. The “thanks for funding” section at the bottom of the paper suggests another motive. FlipperBot was funded in part by the Army Research Laboratory’s Micro Autonomous Systems and Technology alliance (MAST). Descendants of world’s first baby turtle robot will serve in the Army. Since 2008, MAST has provided about $7 million in bill-paying per year for fundamental diminutive biomimetic robot research—machines that borrow traits from living creatures. At Berkeley, engineer Robert Fearing is working with MAST money on a family of six-legged millirobots, including Taylroach, which sports a tail that allows it to quickly turn 90 degrees, and 1STAR, a single actuator robot with spinning tripods for feet, which took home a finalist for best video nod at the International Conference on Robotics and Automation in June. Fearing’s hexapeds are about the size of gerbils. At the University of Pennsylvania, engineer Vijay Kumar is leading a project called SWARMS, to study how animals move in groups—and how military robots might, too. What’s the Army doing with an army of adorable machines? For the Army Research Laboratory, the goal here is to provide the basic knowledge necessary to build semiautonomous “companion robots” for soldiers, Brett Piekarski, MAST’s current manager, tell me. The descendants of MAST research will be small enough to fit in the palm of a soldier’s hand and, at 100 grams, easy to tote in the pocket of a pair of cargo pants. And, of course, the highly trained dog military dog of the future is not a canine at all, but some tiny hybrid of a turtle, snake, roach, maybe outfitted with one of Fearing’s robot-tails, designed to expertly travel over sand, stick, leaves, and rubble, like the animals they are based on. They’re sure to be cute. If it sounds like I am projecting sympathetic features onto machines, I am. I was a kid in the ’90s, a decade of personified toy machines: clumsily life-like Furbies, Tamagotchis, and electronic dog Poo-Chi were all enviable playroom companions. In college, I studied physics; to me, Goldman’s animal-like models, equations and theory come to life, are endearing. “Adorable” is in the eye of the beholder, but you’re probably with me to at least some extent: As Kate Darling at MIT’s Media Lab points out, people name and feel empathy for Roombas, the automatic vacuum cleaner that autonomously avoids objects while sucking up dirt. A Roomba doesn’t know your leg from a table leg—but it “interacts” and that’s enough. The inherent cuteness of robots—especially bio-inspired ones—is a problem for the military. Even current, utilitarian, robots garner affection: Some soldiers award them medals of honor or request to have them repaired, rather than whole-sale replaced, Darling notes. Robotics consultant Julie Carpenter found in her doctoral research that when robots are totally totaled, some are put to rest with a funeral ritual. Add real interaction and lifelike features, and the connection can grow stronger: Darling led a workshop in which she instructed participants to bond with a sweet and sophisticated toy dinosaur called Pleo (it currently sells for about $500 on Amazon) that expresses a range of positive emotions from happy to curious. Darling instructed participants to torture and “kill” their Pleos. Pick a Pleo up by its tail, and it bleats in fear. The participants could hardly bring themselves to strike the mess of wires and sensors. In the end, only one of the toys was harmed, and only when Darling threatened to destroy all the Pleos if the participants did not sacrifice at least one, single dino. But as Darling explains to me, military robots are “tools that need to be treated like tools.” Their cuteness—probably somewhere between a Pleo and a Roomba—is a bug. Though Pierkarski refers to the future tools as “companions,” they are not actually living things. For soldier to feels even some of the pain of Darling’s Pleo-workshop participants could be, at a minimum, distracting in high-risk scenarios. If you are sending a robot to check an area for explosives, it helps if you are emotionally OK with the thing being blown up. To me, FlipperBot and its kin register not just as animals, but something out of my childhood. One Christmas in particular, Santa left me a set of K’nex, with a motor and instructions to create a triceratops. I spent that winter break watching the plastic creature toddle around the living room. My heart still pangs to think of the toy disassembled in a box in my parents’ basement. To think of its cousins enlisted actually feels a little painful. I am charmed at an animated pile of plastic pieces, and I’m charmed by military robots, too. In the end, it’s not the military’s potential attachment to these companion creatures that gets to me, but my own. I spent the week writing this article with videos of RHex, a larger and more mature cousin of the MAST research, scattered in windows on my laptop screen. RHex goes for walks. RHex does parkour backflips. RHex pads around in the snow. RHex chases a ball. RHex … joins the Army? In a world of shareable cute videos, and short “fun” journalism, it is a detail that’s easy to miss.